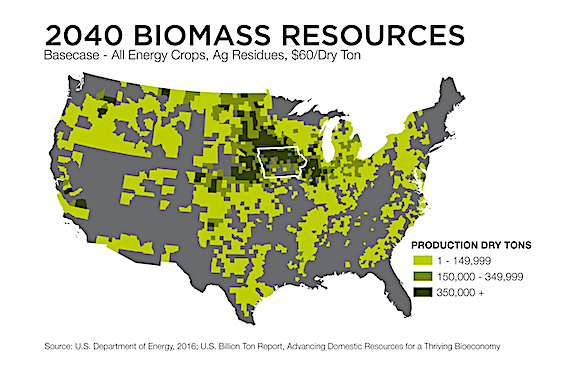 Iowa: Cultivating Growth in Bioprocessing : Biofuels Digest | Alternative Energy news. We provide you with the latest breaking news and videos straight from the Alternative Energy industry. First and foremost, I’m happy to report that the nation’s bio-economy is as strong as it has ever been. Nearly $4 billion dollars was infused into capital investments in the U.S. for renewable and bioscience projects in 2018. This significant investment is merely part of an upward trend that’s yielded more than 273,000 new jobs at bioscience companies across the country since 2001. According to a survey conducted by Biofuels Digest, half of U.S. bioscience companies plan to expand operations within the next year. Despite the industry’s positive prognosis, the path forward presents a few roadblocks. Logistical, regulatory and economic challenges can stifle growth and suppress innovation. In fact, the aforementioned survey revealed that support from state leadership, suitable locations and the availability of a skilled workforce are among the primary concerns for bioscience industry leaders. These findings echo the sentiments I’ve heard in one-on-one conversations, and raise the question of how deep of an impact these roadblocks have had on the progress of the industry. • A business-friendly and research-driven environment. With an eye to achieving measurable growth and solidifying Iowa as a hub for innovation, our state leaders understand the importance of fostering a business-friendly regulatory environment. Iowa’s Renewable Chemical Production Tax Credit incentivizes production of biochemicals from biomass feedstocks by offering up to $1 million dollars annually in tax benefits for companies interested in producing renewable chemicals in Iowa. Furthermore, process improvements — including revamped applications, new business assistance tools and streamlined permit options — have led to a 56 percent reduction in the time it takes for the state to issue air construction permits. These policies and procedures allow Iowa to put businesses in a position to achieve and sustain growth, while keeping environmental and sustainability considerations at the forefront of all decisions. Iowa’s research universities conducted $512 million in biosciences research and development in 2016 alone. . And, since Iowa is intimately familiar with the full supply chain — from raw ingredients to finished goods and their byproducts — we’re a place where companies can manage their process from ideation to production. • A skilled workforce. When my career in economic development began, the availability of a skilled workforce rarely charted as a top consideration for site selectors. Today, it’s critical. Toward that end, public and private entities throughout the state — including job-readiness programs like Future Ready Iowa — have invested in offering apprenticeships, internships and other professional development opportunities to our labor force to close the skills gap. Iowa’s registered apprenticeship programs have grown nearly 70 percent since 2011, and more than 130 companies were awarded nearly $2 million dollars to hire qualified interns in 2018. Beyond the boom these opportunities provide for the state, they’re equally as beneficial for the women and men who work and live here in Iowa. • “Location, location, location.” The age-old adage still holds true, especially for bioscience companies on the move. Finding appropriate development sites, especially on a tight timeline, is a common challenge for developers and the driving need behind Iowa’s Certified Site program. Created in partnership with a third party, the program streamlines the site selection process and offers interested developers multiple categories to fit their needs, including green business parks, industrial sites and mega sites (1,000 acres or more). All sites meet foundational development criteria (including secure land and transportation/utility infrastructure), but green sites can help meet corporate sustainability goals — a crucial need for the continued viability of the biosciences. Agriculture is in our DNA — it always has been and always will be. And as the world of agriculture evolves and intertwines with the biosciences, Iowa remains deeply committed at all levels to growing the industry in our state and cultivating an environment primed for supporting and driving the nation’s growing bio-economy. Simply put, it’s an exciting time for bioscience in Iowa. In fact, next year, Des Moines will host the 2019 BIO World Congress on Industrial Biotechnology — the first time this event has been held outside of the coasts or Canada! While some were a bit surprised that Des Moines was selected as the host city, we think attendees will be pleasantly surprised to learn we’re much more than cornfields and midwestern values. The future of bioprocessing has a home here in Iowa, and we welcome anyone who would love to grow with us. Debi Durham is the director of the Iowa Economic Development Authority. She was appointed to lead the agency by Governor Terry Branstad in January 2011. Previously, she was the president of the Siouxland Chamber of Commerce and the Siouxland Initiative.